And why is it used? Micro Concrete, otherwise known as micro cement (although there are some small differences between the two), is an increasingly popular design product. It enables designers to create a concrete aesthetic where it would not normally be possible, and at a fraction of the cost of using the traditional material. Read on to discover five things that you need to know about this awesome surface covering if you are involved with design, or are keen to improve the look of your home or workplace. 1. What is micro concrete? Micro concrete is a cement based coating which can be applied thinly (approximately 2-3mm) to a range of different surfaces including tile and wood. It provides the look and feel of concrete at a fraction of the cost and weight of real concrete. Micro concrete – sometimes called microconcrete or MicroConcrete – is a great option for bathrooms, kitchens as it provides a hygienic, and stain free surface. What is more, the material is anti-slip and mould free – making it a fantastic choice for floor surfaces inside and out. It’s similar to another material called microcement. You can find out more about microcement and microconcrete here. To highlight the functionality and contemporary look of micro concrete just take a look at the staircase and back wall created by the guys at Design Concrete Notting Hill. 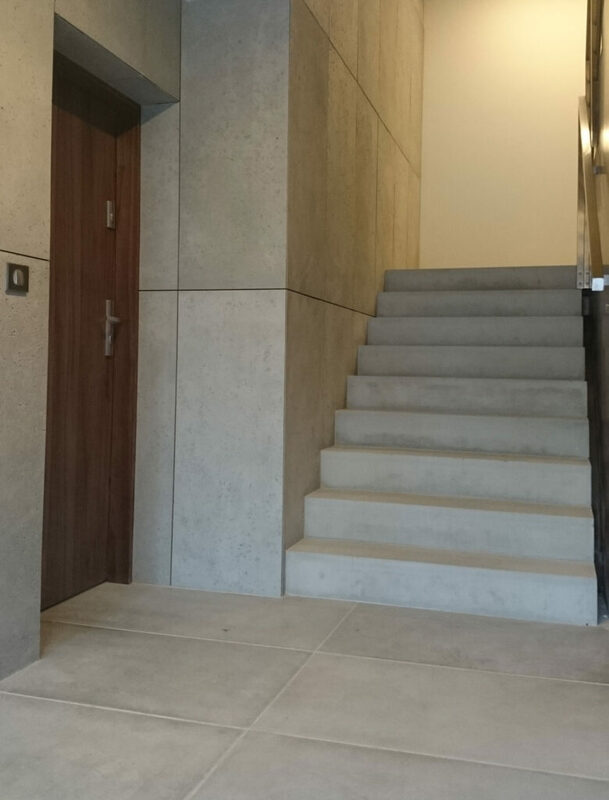 The wall and stairs look as if they have both been made completely from concrete, but thanks to this material, which was used to cover the underlying surface of the wall and stairs, the concrete aesthetic was achieved far more easily and cheaply. The inspirational interior design project below shows how versatile the material is. It can be used to cover a range of items in the home including dining room tables, floors and walls. Also, the image shows how different textural finishes can be achieved. 2. Why is micro concrete used? Micro concrete is available in a convenient one component, prepackaged mix which makes it easy to use and lay. The prepackaged mix also means no professional tools are needed, and allows the mix to be applied by hand. As a result, the finished surface quality is enhanced and consistent. What is more, by eliminating the need for onsite concrete mixing, human errors are almost completely prevented. This makes the product an easy surface option for almost any environment where a faux concrete finish is wanted. It is also ideal for those with limited space and concrete laying skills. Micro concrete was initially developed to reduce the demand for water compared to conventional concrete. As a result of its ease of use and ability to adhere to other materials, the material became the product of choice to effectively to repair cracked or ageing concrete structures. Also, no pumping is needed which reduces the requirement of heavy machinery. Not only does this reduce application costs, but it makes a big difference when working areas with limited access. Micro concrete is often used because it drys quickly which gives designers and those wanting to redecorate their homes a surface option that causes minimal disruption. In fact, it dries so quickly that the covered surface could be functional within 1 day. The quick drying time means that the resultant surface also has a consistent controlled quality. As micro-concrete dries so quickly it can be applied one day, and then the item can be used the next – making it a great choice for those wanting to get projects done quickly. In addition, it is easy to apply and looks professional – without the need for expensive professional tools. 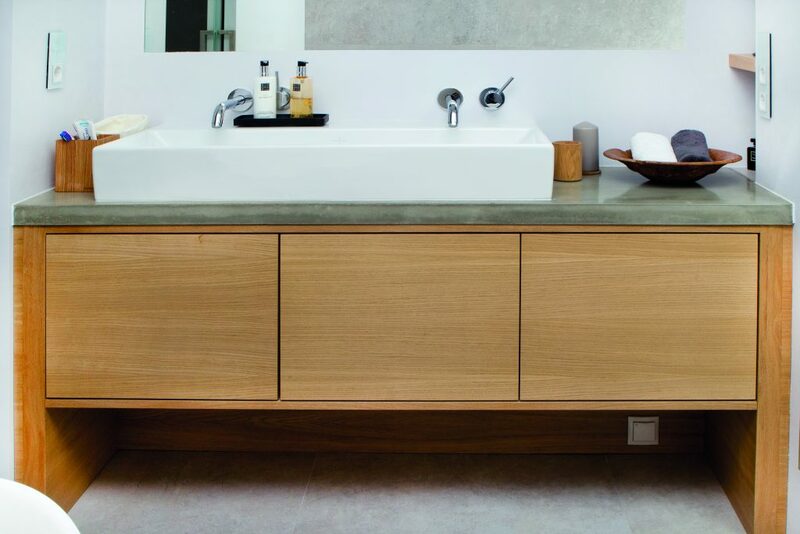 This image from Modern Home Solutions demonstrates how sleek micro concrete surfaces look, and also shows how the surface is water resistant and seamless- making micro-concrete a fantastic surface choice for sinks. 3. What are the main advantages of micro concrete? 4. How is micro concrete used? Micro concrete has been used for numerous applications, both residential and commercial. It has been used for items such as kitchen surfaces and shelves as it provides a seamless, durable and contemporary finish. It is durable and can be applied easily to surfaces internally and externally. It’s is a great option for those looking to add an affordable hard wearing concrete aesthetic to floors or walls anywhere. It is also a waterproof material and therefore it makes for an ideal covering option for bathrooms and splash backs in kitchens. Micro concrete is a versatile product that is available in a range of textures, tones and colours. One of the possible textures and colours options that is available is evident in the image above. As a result, micro concrete is a great option for those wanting to offer unique design elements, and a contemporary finish to their applications. 5. What is the best practise for applying micro concrete? Micro concrete is unlike conventional concrete because it does not require special laying skills or machinery. However, in order to get the best finish possible it is important to follow best practice when applying the material. The first stage of applying micro concrete is surface preparation. The surface that is going to be covered has to be washed and cleaned, with any dust, gravel or dirt removed. Then, any metal or exposed reinforcement that could corrode needs to be cleaned, and then coated for protection. Micro concrete can be mixed by hand, but if a large quantity is needed then it is easier to use a mixing vessel. The amount of water needed varies dependant on the mix, however it is usually about 1:8 (water to micro concrete). To mix, the micro concrete needs to be added to water slowly whilst being constantly stirred. Once completely combined it is important to pour the micro concrete onto the prepared surface as soon as possible for the best flow and consistency. Then, using clean tools simply smooth the mix out and allow it to dry. To conclude, micro concrete is an awesome material that is sure to become a go to surface choice for design professionals. As a result, we want to spread the word! If you have used micro concrete in your recent design project, we would love to hear about it, so let us know in the comments section below. If you’re considering using micro concrete in a design project, you can find out more about about microconcrete and its applications here. Equally, we’re very happy to talk through how we can help with your installation. Give us a call or drop us an email today. Micro Concrete, otherwise known as Micro Cement, is a popular design product for those who want to create a concrete aesthetic where it would not normally be possible. Micro Concrete is a cement based coating which can be applied thinly (approximately 2-3mm) to a range of different surfaces to provide the look and feel of concrete at a fraction of the cost and weight of real concrete. Why is Micro Concrete used? Micro Concrete was initially developed to reduce the demand for water as compared to conventional concrete. As a result of its ease of use and ability to adhere to other materials, micro concrete was used effectively to repair cracked or ageing concrete structures. Also, no pumping is needed which reduces the requirement of heavy machinery. Not only does this reduce application costs, but it also makes micro concrete a good option for areas with limited access. Source:- what is MICRO CONCRETE | why it is used?